Japan Rail Pass gives you unlimited Japan Rail (JR) train access for the purchased period of time. Japan has multiple train companies, and JR is the main one for travel across Japan, but not for more specific areas within the city. Japan Rail Pass can only be purchased outside of Japan. It is available in 7, 14, 21 day versions. When you purchase it, you will receive a voucher that you need to validate once you get to Japan. I recommend to validate the pass right at the airport. Validating means that you will actually get the pass, and you can state the effective/start date especially if you're travelling for more days than your pass. Japan Rail Pass is only valid on JR lines (including certain shinkansen lines), JR buses, Tokyo Monorail for Haneda Airport, the Narita Express for Narita Airport. The link above should have more details. Japan Rail Pass will only make sense for you if you will have at least one long trip (i.e. Tokyo to Kyoto), and perhaps multiple short trips such as going to Nara, Nagoya, Osaka, Hiroshima, etc. If you will only be travelling within Tokyo, you won't always be using the JR trains. the JR pass doesn't cover subway lines. If you will only be travelling within Kyoto, it wouldn't make sense as a lot of the buses/subway lines are not JR. But I found Kyoto to be a great hub for travelling to different cities such as Nara and Osaka. First thing we did while waiting for our hotel check-in was to head to the Fushimi Inari shrine. 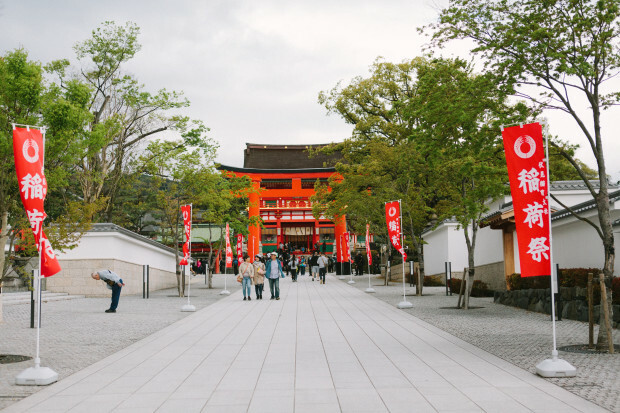 It's really easy to get there from the Kyoto Station, you will only need to stop at the Inari Station, and the shrine can be accessed just in front of the station. When they call it shrine, they're referring to it as a Shinto Shrine, which is one of the two religions that a lot of Japanese practice. 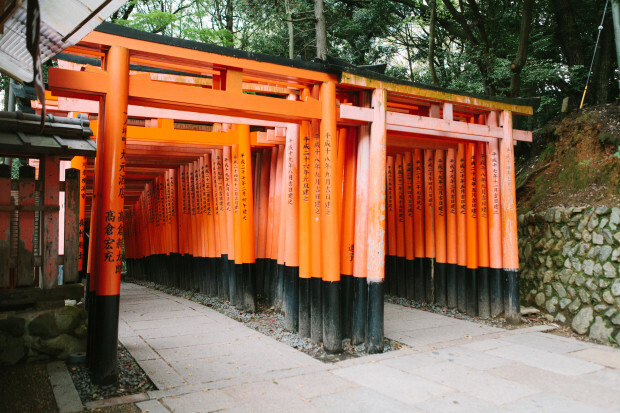 This shrine is very famous for their multiple vermillion torii gates. We didn't realize that April was school-trip season. C & I were starting to wonder why there's so many students around, all the time! 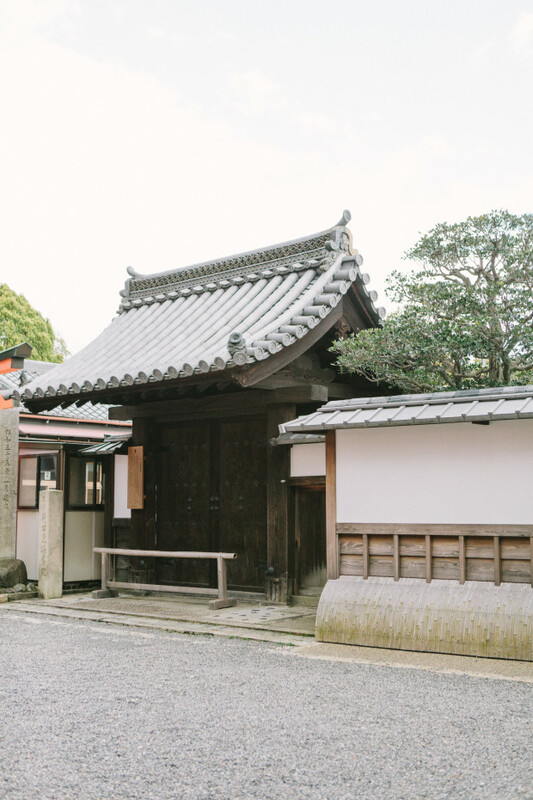 I am so in love with the traditional Japanese architecture. I love that they preserve it so well in Kyoto! Lots of wishes all hung up on the walls of the shrine. And these crazy origami garlands!! The last of the cherry blossom season in Kyoto. Love that you can get calligraphy done instantly in the shrine! The shrine itself goes up the mountain, and it was so rainy that day that we didn't really feel like hiking up all the way to the top. Saw this guy carting all the donations away! Now the famous Senbon Torii Gates!